1. Preheat the oven to 200ºC, gas mark 6. Tear the bread into bite size pieces and toss with the garlic oil. Spread out on a large baking sheet and bake for 10–15 minutes until golden brown. Remove from the oven, then set aside. 2. Stir together the mayonnaise and vinegar to make a pourable dressing. 3. Separate the lettuce leaves and tear into smaller pieces, then place in a large salad bowl. Slice or break up the chicken into bite size pieces and add to the lettuce. 4. 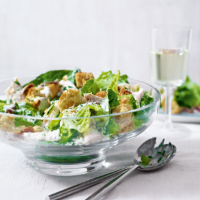 Scatter the anchovies, warm croutons, Parmigiano Reggiano and chives over the salad. Drizzle over the dressing, finish with a good grinding of black pepper and serve. This recipe was first published in Wed May 13 15:23:00 BST 2015.